Home > Practice Jewel / Massage manEdger > Clinic Settings and Management > How do I create patient SOAP Notes? "How do I create patient SOAP Notes?" 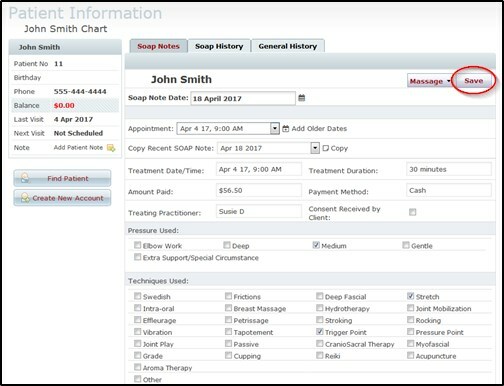 The Client SOAP Note tool allows you to document and monitor client treatment activities and progress. Notes can be recorded on each session and then reviewed before the next session. The tool provides a drop down list of recent client appointments, check boxes for pressure used, techniques, areas treated, four independent text boxes, one for each documentation (Subjective observations, Objective observations, Assessment and Plan) and a copy function to duplicate a previous note. Here's how SOAP Notes are created. The appointment menu will list all of the selected patient’s appointments within the past 30 days. If you are creating a note for an older treatment, you can click “Add Older Dates” to add all previous dates to this list. Once an appointment has been selected, the treatment date & time, practitioner, and duration fields will fill in automatically based on what is in the calendar. If the appointment has been checked out, the amount paid and payment method will also populate based on the client invoice saved in the system. The past five SOAP notes for your patient will be located in the “Copy recent SOAP note” list if you wish to copy them. To copy a previous note, just select the date you wish to copy and click “Copy selected note data” to populate the information from the old note into your new note. You may then change or update any necessary information. Note: If you do not wish to use the check boxes, you can also select the “General” template from the template menu beside the save button to reduce the page to only the SOAP note boxes. Once complete click the Save button. Your client SOAP notes are stored by client and then ordered by date. Click on the SOAP history tab to review past client treatment notes where they can be reviewed, edited, and/or printed.